Background Although it has been hypothesized that the diabetes-depression relation is bidirectional, few studies have addressed this hypothesis in a prospective setting. Methods A total of 65 381 women aged 50 to 75 years in 1996 were observed until 2006. Clinical depression was defined as having diagnosed depression or using antidepressants, and depressed mood was defined as having clinical depression or severe depressive symptoms, ie, a 5-item Mental Health Index (MHI-5) score of 52 or less. Self-reported type 2 diabetes mellitus was confirmed by means of a supplementary questionnaire validated by medical record review. Results During 10 years of follow-up (531 097 person-years), 2844 incident cases of type 2 diabetes mellitus were documented. Compared with referents (MHI-5 score of 86-100) who had the best depressive symptom scores, participants with increased severity of symptoms (MHI-5 scores of 76-85 or 53-75, or depressed mood) showed a monotonic elevated risk of developing type 2 diabetes (P for trend = .002 in the multivariable-adjusted model). The relative risk for individuals with depressed mood was 1.17 (95% confidence interval [CI], 1.05-1.30) after adjustment for various covariates, and participants using antidepressants were at a particularly higher relative risk (1.25; 95% CI, 1.10-1.41). In a parallel analysis, 7415 cases of incident clinical depression were documented (474 722 person-years). Compared with nondiabetic subjects, those with diabetes had a relative risk (95% CI) of developing clinical depression after controlling for all covariates of 1.29 (1.18-1.40), and it was 1.25 (1.09-1.42), 1.24 (1.09-1.41), and 1.53 (1.26-1.85) in diabetic subjects without medications, with oral hypoglycemic agents, and with insulin therapy, respectively. These associations remained significant after adjustment for diabetes-related comorbidities. Conclusion Our results provide compelling evidence that the diabetes-depression association is bidirectional. Depression and diabetes are highly prevalent in the US population. More than 10% (23.5 million) of US adults have diabetes, and the prevalence is much higher in the elderly (23% in those aged ≥60 years).1 Major depressive disorder affects approximately 14.8 million American adults, or about 6.7% of the US population aged 18 years and older in a given year,2 and it has been estimated that the lifetime incidence of depression is more than 20% in women compared with 12% in men.3 Therefore, an association between diabetes and depression in middle-aged and elderly individuals, especially women, deserves careful examination. The comorbidity of depression in patients with type 2 diabetes mellitus has been observed in several studies. Anderson et al4 summarized 20 cross-sectional reports and found that the odds of depression in the diabetic group was twice that of the nondiabetic comparison group. Nevertheless, this could be explained by 2 scenarios: that depression may occur as a consequence of having diabetes or as a risk factor for the onset of type 2 diabetes. Therefore, the temporal relationship has attracted much attention in the past few years. A meta-analysis of cohort studies found that depression was associated with a 60% increased risk of type 2 diabetes, whereas the evidence supporting the opposite direction was less convincing.5 To our knowledge, only a few studies have simultaneously investigated the bidirectional association between type 2 diabetes and depression, but the results are inconsistent.6-8 Therefore, we took advantage of repeated measurements of lifestyle risk factors and disease occurrences (including depression and diabetes) during 10 years of follow-up in a large prospective cohort to address the bidirectional relationship between diabetes and depression. The Nurses' Health Study cohort was established in 1976 when 121 700 female registered nurses aged 30 to 55 years residing in 11 states of the United States responded to a mailed questionnaire regarding their medical history and health practices. The cohort has been followed up every 2 years with mailed questionnaires that update exposure information and inquire about newly diagnosed medical illnesses. Details have been published elsewhere.9,10 Up to 2006, the follow-up rate of the entire cohort was greater than 94%. The study protocol was approved by the institutional review boards of the Brigham and Women's Hospital and Harvard School of Public Health. We used the 1996 questionnaire cycle as a baseline when clinical depression–related questions were first asked (n = 100 939). Participants with no information on depression status at baseline (antidepressant medication use, n = 10 866; physician-diagnosed depression, n = 6131), a history of type 1 (n = 266) or gestational (n = 285) diabetes mellitus, cancer (n = 9941), coronary heart disease (n = 6180), and stroke (n = 845) at baseline were excluded from the analysis. We further excluded participants with secondary diabetes (n = 323) and those with unknown or uncertain diabetes diagnoses or diagnosis dates (n = 721) at baseline and during the follow-up. Therefore, 65 381 participants were left for the present analyses. Self-reported symptoms of depression, use of antidepressant medication, and physician-diagnosed depression were used as measures of depression. Depressive symptoms were assessed in 1992, 1996, and 2000 with the Mental Health Index (MHI-5), a 5-item subscale of the 36-Item Short-Form Health Survey designed to capture psychological distress vs well-being.11-13 The participants were asked how much of the time during the past month (all, most, a good bit, some, little, or none) they (1) felt nervous, (2) felt so down that nothing could cheer them up, (3) felt calm and peaceful, (4) felt down and blue, or (5) felt happy. The scale was scored from 0 to 100, with lower scores indicating more severe depressive symptoms (SDS). The MHI-5 has been shown to have high sensitivity and specificity for major depression, with an area under the receiver operating characteristic curve of 0.88 to 0.91 for the detection of major depressive disorder.14 In accordance with our previous study using this scale,10 we divided the participants into 4 categories of depressive symptoms according to their MHI-5 score (86-100, 76-85, 53-75, and 0-52). Participants were first asked to report regular antidepressant medication use in 1996, and this was used as the baseline year for these analyses. This information was updated biennially through 2006. The type of antidepressant use was first inquired about in 2000, when participants were asked to specifically report their regular use during the past 2 years of selective serotonin reuptake inhibitors (including fluoxetine hydrochloride, sertraline hydrochloride, paroxetine hydrochloride, and citalopram hydrobromide), or other antidepressants, of which the tricyclic antidepressants amitriptyline hydrochloride, imipramine hydrochloride, and nortriptyline hydrochloride were provided as examples. This information was updated every 2 years thereafter. The nurses were first asked in 2000 whether they had ever (in 1996 or before, 1997-1998, 1999, or 2000) had physician-diagnosed depression. This information was also updated biennially. Therefore, clinical depression was defined as a reported physician-diagnosed depression or antidepressant use. For the analysis of whether depression increased the risk of developing diabetes, we created a proxy measure for depressive symptom severity by using the MHI-5 score and clinical depression information. The participants were categorized into 4 groups: MHI-5 score of 86 to 100 (reference group), MHI-5 score of 76 to 85, MHI-5 score of 53 to 75, and depressed mood (defined as a score of ≤52 or with clinical depression). Because our 2 objectives required different population samples, we hereby described analysis samples and procedures separately. In addition to the exclusion criteria already mentioned, participants who had prevalent type 2 diabetes mellitus at baseline (n = 3298) or had missing data on the depressive symptoms status at baseline (n = 4203) were also excluded, and thus a total of 57 880 participants were included in the analysis. Person-years for each participant were calculated from the date of return of the 1996 questionnaire to the diagnosis date of confirmed type 2 diabetes, death from any cause, or June 2006, whichever came first. Cox proportional hazards models were used to estimate age- and multivariable-adjusted relative risks (RRs) of developing type 2 diabetes in participants with depressed mood compared with those without. The basic model included age in 5-year categories, marital status (currently having a spouse or not) and family history of diabetes (yes or no); model 2 included the terms in model 1 plus lifestyle factors, including alcohol consumption (never, 0-4.9 g/d, or ≥5.0 g/d), smoking status (never, past, or current), physical activity level (<9 or ≥9 MET-h/wk), and dietary information (coffee, whole-grain, soft-drink, and meat consumptions, all in 3 categories); model 3 included the terms in model 2 and BMI categories (<25.0, 25.0-29.9, or ≥30.0). We selected these factors a priori because of their previous reported associations with diabetes or depression.6-8 Depression exposure was treated as a time-dependent variable, and multivariable models included the updated time-dependent covariates as used in our previous analyses.10 A complementary analysis using data from 2000 and 2006 was performed to explore the effects of different types of antidepressant medications and risk of incident diabetes. In the 65 381 participants, individuals were excluded if they had physician-diagnosed depression at baseline (n = 3710), used antidepressant medications at baseline (n = 2077), provided no information on antidepressant medication use in 1998 (n = 2714), or had inconsistent data on diabetes medication use in 1996 (n = 23), leaving 56 857 participants for this analysis. Depressive symptoms (MHI-5) were assessed only in 2000 during the follow-up; hence, clinical depression was used as the end point. Because there is no exact diagnosis date for depression, the diagnosis date was estimated to be in the middle of the 2-year cycle when clinical depression was first reported. Person-years for each participant were calculated from the date of return of the 1996 questionnaire to depression diagnosis date, death from any cause, or returning date of the 2006 questionnaire, whichever came first. Cox proportional hazards models with time-varying variables were used to estimate age- and multivariable-adjusted RRs of developing clinical depression in participants with type 2 diabetes compared with those without. We again used the same series of multivariable models as in analysis 1. Further analyses were performed to investigate the effects of different diabetes management strategies (without medications, with oral hypoglycemic agents, or with insulin therapy) on incident clinical depression. For both analyses, we first compared means or proportions of covariates across categories of depressive symptoms (analysis 1) and diabetes severity (analysis 2) reported in 1996. For these comparisons, we used Mantel-Haenszel χ2 tests for categorical variables and analysis of variance for continuous variables. All reported P values were 2-sided, and statistical analysis was performed with SAS statistical software version 9.1 (SAS Institute Inc, Cary, North Carolina). Table 1 summarizes the characteristics of the participants without prevalent type 2 diabetes mellitus by baseline depression status. Compared with the referents (MHI-5 score of 86-100), women with higher levels of depressive symptoms were more likely to be younger, have no spouse, and smoke cigarettes, and less likely to consume alcohol and be physically active. Participants with depressed mood had higher BMI than those least depressed. During the 10-year follow-up (531 097 person-years), 2844 incident cases of type 2 diabetes were documented (Table 2). Compared with the referents (MHI-5 score of 86-100), age-adjusted RRs (95% confidence intervals [CIs]) of developing type 2 diabetes for women with MHI-5 scores of 76 to 85 and 53 to 75 and depressed mood were 1.07 (0.97-1.17), 1.24 (1.11-1.38), and 1.42 (1.28-1.58), respectively (P for trend <.001). The RRs were slightly attenuated by including marital status and family history of diabetes in the model and remarkably attenuated after controlling for lifestyle factors (particularly physical activity) and BMI categories but remained significant with RR of 1.17 (95% CI, 1.05-1.30) for those with depressed mood (P for trend = .002). We further categorized the participants with depressed mood into 3 groups: women with only SDS (MHI-5 score ≤52), those with physician-diagnosed depression but not taking antidepressants, and those taking antidepressant medications. In the fully adjusted Cox model, only women using antidepressant medications had a significant increased risk of incident type 2 diabetes compared with those with MHI-5 scores of 86 to 100 (RR, 1.25; 95% CI, 1.10-1.41), whereas individuals with only SDS or diagnosed depression were not at increased risk (Table 2). A complementary analysis using data from 2000 to 2006 showed that those using selective serotonin reuptake inhibitors had a 19% (95% CI, 1%-41%) increased risk of incident diabetes in the multivariable-adjusted model without BMI, whereas using other antidepressants (mainly tricyclic antidepressants) was associated with 25% (95% CI, 0%-56%) increased risk. However, the relative risks were attenuated after further adjustment for BMI (1.06; 95% CI, 0.90-1.26, and 1.19; 95% CI, 0.95-1.33, respectively). Multiple antidepressant use was not associated with diabetes risk in either model because of limited power (data not shown in tables). The characteristics of the participants without prevalent depressed mood by diabetes status are shown in Table 3. Compared with nondiabetic women, those with diabetes were more likely to be older and have no spouse, and less likely to consume alcohol and be physically active. Participants with diabetes had a higher BMI than did nondiabetic individuals. During 10 years of follow-up (474 722 person-years), 7415 incident cases of clinical depression were documented. As shown in Table 4, compared with nondiabetic subjects, the RR of developing clinical depression in participants with type 2 diabetes was 1.44 (95% CI, 1.33-1.57) in the age-adjusted model. The RR decreased to 1.29 (95% CI, 1.18-1.40) after adjustment for the covariates. Controlling for some major comorbidities (hypertension, hypercholesterolemia, coronary heart disease, and cancer) attenuated the association, but it remained significant (RR, 1.20; 95% CI, 1.10-1.31; data not shown). Similar results were found in the sensitivity analysis, which excluded those with other antidepressant medication use while free of selective serotonin reuptake inhibitor use or self-reported physician-diagnosed depression (data not shown). We then further divided the diabetic participants into 3 groups (without any medications, with only oral hypoglycemic agents, and with insulin therapy) to reflect the severity and management of the disease. Age-adjusted RRs of developing clinical depression was 1.36 (95% CI, 1.19-1.55), 1.42 (95% CI, 1.25-1.60), and 1.78 (95% CI, 1.47-2.15) for diabetic women without medications, with oral hypoglycemic agents, and with insulin therapy, respectively (P for trend <.001). These associations remained significant with adjustment for the covariates (RR, 1.25; 95% CI, 1.09-1.42; RR, 1.24; 95% CI, 1.09-1.41; and RR, 1.53; 95% CI, 1.26-1.85, respectively). Incorporation of major comorbidities markedly decreased the RRs, but they remained statistically significant. The findings from this well-characterized cohort of more than 55 000 US women with 10 years' follow-up add to the growing evidence that depression and diabetes are closely related to each other, and this reciprocal association also depends on the severity or treatment of each condition. All the associations were independent of sociodemographic, diet, and lifestyle factors. In the present study, depressed mood (SDS or clinical depression) was moderately associated with increased likelihood of developing type 2 diabetes mellitus after adjustment for various covariates. These results are consistent with accumulating evidence that depression is a significant risk factor for developing type 2 diabetes.5,28,29 In addition, we found that adjustment for BMI and lifestyle factors (particularly physical activity) substantially decreased the RR, indicating that BMI and physical activity could be the major mediating factors. However, the association remained significant after controlling for BMI and lifestyle factors in our models, suggesting that depression has effects on incident diabetes independent of adiposity and inactivity. Furthermore, our results showed that women taking antidepressant medications were at higher risk of developing type 2 diabetes than those with only SDS or physician-diagnosed depression. This is consistent with the observations in the Diabetes Prevention Program study,30 in which Rubin et al reported a strong and statistically significant association between antidepressant use and diabetes risk in the intensive lifestyle and placebo treatment arms. This could be attributed to 2 reasons: first, antidepressant use may be a marker of more severe depression or a history of chronic or recurrent depression30; second, antidepressant use itself may increase the diabetes risk. Previous studies also suggested that antidepressants may exert some clinical effects on glucose homeostasis,31 but the results are inconsistent. In addition, antidepressant use is shown to be associated with weight gain.32 Although the results remained significant after adjustment for current BMI (or baseline BMI plus weight gain; data not shown), we could not fully exclude the residual confounding effects. Whether antidepressants have independent effects on diabetes warrants further investigation. The present study was well suited to investigate the complex association between depression and type 2 diabetes by using biennially repeated measurements of the diseases along with their risk factors. Therefore, time-dependent Cox regression models were performed to incorporate these repeated measures, which minimized the possibility of residual and time-dependent confounding. Consequently, we could simultaneously test the 2 temporal hypotheses of whether depression predicts future type 2 diabetes and, vice versa, whether type 2 diabetes increases the risk of incident depression. Furthermore, we used 3 measures (the MHI-5 scale, antidepressant use, and physician-diagnosed depression) to define depression status. In addition, participants with coronary heart disease, cancers, and stroke at baseline that could be associated with mood disorders were excluded from the analysis. Including those with depression-associated general medical conditions did not change the results (data not shown). Several limitations should also be borne in mind when interpreting our findings. First, the study sample was a homogeneous population; all the participants were registered nurses and more than 94% were white. They had a greater concern about their health and better understanding of health-related issues, which enhanced the reliability of our questionnaire assessment; however, the results might not be generalized to other populations. Second, the exact diagnosis date of depression was not available, which may lead to reverse causation to some extent in the present analysis. However, we estimated and used the date of incident depression by several different approaches in sensitivity analyses, and the results did not change materially. Third, information on physician-diagnosed depression and antidepressant use was self-reported. 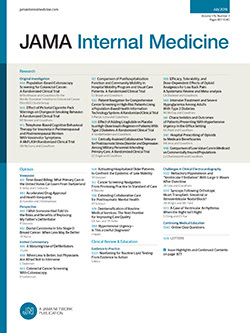 Physician recognition rate of major depressive disorder was not high compared with the Structured Clinical Interview for the Diagnostic and Statistical Manual of Mental Disorders (Fourth Edition),38 and the prevalence of untreated mental disorders is relatively high in the United States and other countries.39 Therefore, we speculate that history of or prevalent depression might be underreported. Furthermore, surveillance bias due to the disease diagnosis is also possible in our analyses. This large, well-established cohort study provides evidence that the association between depression and diabetes is bidirectional, and this association is partially explained by but independent of other known risk factors, such as adiposity and lifestyle variables. Future studies are needed to confirm our findings in different populations and to investigate the potential mechanisms underlying this association. Furthermore, depression and diabetes are highly prevalent in the middle-aged and elderly population, particularly in women. Thus, proper lifestyle interventions including adequate weight management and regular physical activity are recommended to lower the risk of both conditions. Although antidepressant medication use might be a marker of severe depression, its specific association with elevated risk of diabetes warrants further scrutiny. Correspondence: Frank B. Hu, MD, PhD, Department of Nutrition, Harvard School of Public Health, 655 Huntington Ave, Boston, MA 02115 (frank.hu@channing.harvard.edu). Accepted for Publication: March 22, 2010. Author Contributions: Dr Hu had full access to all the data (including statistical reports and tables) in the study and takes responsibility for the integrity of the data and the accuracy of the data analysis. Study concept and design: Pan, Lucas, Ascherio, and Hu. Acquisition of data: Manson, Willett, Ascherio, and Hu. Analysis and interpretation of data: Pan, Lucas, Sun, Ascherio, and Hu. Drafting of the manuscript: Pan. Critical revision of the manuscript for important intellectual content: Lucas, Sun, van Dam, Franco, Manson, Willett, Ascherio, and Hu. Statistical analysis: Pan, Lucas, and Sun. Obtained funding: Manson, Willett, Asherio, and Hu. Administrative, technical, and material support: Manson, Willett, Ascherio, and Hu. Study supervision: Ascherio and Hu. Funding/Support: This study was supported by National Institutes of Health grant DK58845 (Dr Hu). Dr Ascherio received a grant from the National Alliance for Research on Schizophrenia & Depression (project ID 5048070-01). Dr Lucas received a postdoctoral fellowship from the Fonds de recherche en santé du Québec. Role of the Sponsors: The funding sources were not involved in the data collection, data analysis, manuscript writing, and publication.